Today’s podcast episode is all about how to keep from getting overwhelmed when you’re shopping for home decor things. And here’s my elegant solution to a common problem. I was having trouble keeping my sheets organized and looking neat in my closet, so we came up with this simple solution. Bed sheet bags. You put each set of sheets in a separate bag. Then the drawer looks neat, and tidy. Just grab a bag and you’re ready for fresh sheets. You can find this set on sale in our shop Bespoke Decor, CLICK HERE for buying info. This post was originally written in 2017, but I’m sharing it again today, because I love the idea of a color of the year. Let me explain. Do you ever notice the Panetone Color of the year thing. Honestly I don’t pay much attention to it. This year it’s Greenery. I actually like the color, but it’s not MY color of the year. My color of the year is lavender. That’s right. I think we should all be able to select our own color of the year. And who’s telling us we can’t? The Spode tureen above is gorgeous in person! I love all of the plum hues. 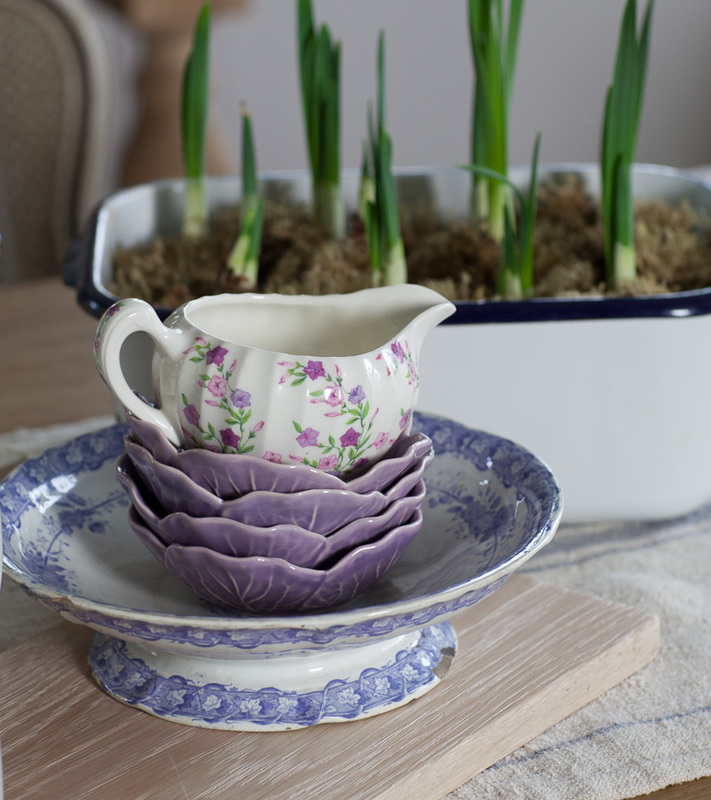 So today I am showing you how I added lavender just using dishes. I do love a pretty plate. As you can see I’ve added lavender plates to my plate rack. These are antique dishes mostly from Holland, but some of the dishes are French. I don’t really care so much where they are from. I just like ‘pretty’. Some of the lavender or purple is more red and some of it is more blue. I like all of it. I bought the bowl below without a lid and with a missing handle. I don’t care, it’s still pretty. I found some purple salvia blooming in my yard so I added it to my table. Yes I know it’s January, but I’m in Houston, so it’s been pretty warm here. So what is YOUR color this year? What color will you be adding? Do you pay attention to the Panetone color of the year? Love your plate racks. Did you have them custom built? Yes I did Easty, thank you. I love them! they are the perfect addition to that niche. I am so glad that you see beauty even in slight imperfection. Your decorating style reaches out and touches me with inspiration! The lavender is such a pretty accent color to your neutrals. . .it really pops but in a quiet way. I like this color for Valentine’s Day better than red, which is not my favorite. Another great post you have inspired me to go and get some flowers today! I need to perk up my mood on this rainy, gray day we are having in the Pacific Northwest. my color for the last two years has been periwinkle. it is also known as french blue. I agree with you, I think everyone should decorate with colors they love. Personally, I love your lavender. Love your color of the year and the way you added it to your dining room….a pleasure to view! I love picking my own color and I have been returning to an old favorite-blue! I’m adding accents of blues throughout our home. I have a different color of the year, too, but I’m afraid to tell anyone. I think I’ll just surprise folks! AMAZING what just a touch of color can do to change a room. Love it! I like Sherwin Williams paints and I use a very light blue grey for walls then accessorize with my favorite colors. I pay zero attention to Pantone’s color of the year. My color of the year has been and will be the robin’s egg or duck egg blue. My walls are a creamy white, the ones I have painted anyway, called Thistle , and my kitchen is Modest Silver, a silvery blue grey. I love it when i see folks decorate with plates and china. I have always had a love for these things, as did my mother and grandmother! I have a small collection of ironstone and transferware, as well as depression glass and tureens. Much of this has been because of the influence of bloggers like you, so thank you! I don’t pay a whole lot of attention to color of the year but I was a bit excited this year because I have green accents in my master of a shimmery deep lime. I’ve had it for several years now and I’m surprised that I’ve yet to tire of it. My front office is a deep green with black undertones. I love your blog! I too love lavender. My living room is lavender walls with lavender toile and ticking furniture. This year I’m adding more shades of yellow into the room. I love antique lace with lavender also. I do love lavender! Great choice for your color of the year. I’ll second that. The plates are beautiful. I use colors that I love not what the color of the year is. Thanks for sharing. I have two! I love coral & teal. I’m loving it with my “greige” walls. And I love that you encourage us to be our own person and not listen so much to what the experts say. After all, you have to love the home you live in! I agree that everyone should have their own color. Color is so powerful and effects each of us differently. I love all shades of purple but don’t use it much in my house. I like how you have added touches in your home. The diversity of colors allows each of us to express those inner “juices” of design. Thanks for sharing your lavender. It is very nice. I don’t pay attention to the color of the year. Blue and white are my faves! My color of the year is blue… varying shades and hues. Beautiful! I will be adding more blue to my home once it is built. I can never pass up a blue/white plate, platter or saucer. ONe of my favorite ways to display them is to hang on the walk in the shape of a cross. I wish I knew how to send you a picture of one over my guest room bed (my grandmother’s). My all time favorite color is blue. However, I love red as it seems very cheerful and happy to me. I am not into an excess of white or tan in my color schemes. Really enjoyed seeing the purple salvia and the blue pitcher on the table vignette. A friend is building her dream home and the laundry room is lavender. With 3 kids she says she spends a lot of time in there and wanted a color she loved. I am adding more blue – blue & white china and toile. We all need to live with the colors that make us happy. But what I really loved was your use of vintage dishes, perfect or not, to add touches of color and as a basis for inspiring displays. Happy New Year! Love the lavender! My craft room has lavender walls, and I have collected bits of lavender glass and lavender china to display. A favorite is a tiny Limoge oval lidded dish (sugar bowl?) with lavender flowers and gilded edges that I use to hold pins at my sewing table. My color this year is red, because my hubby wanted red in the master we’re redoing. I love it, too, but it’s not an “in” color right now. Happily, I have red transfer ware from my mom to use to bring the red in. I still love blues and greens. Thanks so much for the wonderfully creative vignettes you share…I have several saved to “imitate”. Blessings to you and yours this new year! Love the color but really love the plate rack. Was that purchased or custom made? That came from Ballard Designs Lynne. Anita, I agree that we should pick our own favorite color. I like homes that are unique to their owners. It is true that we find inspiration and ideas from others, we might totally miss what color can really be a great accent that makes our home pop if not for the help of others. I appreciate that you always stress ‘To thine own self be true’! By the way, I love the touch of lavender!! Love y R website and enjoy following it very much. Your plates are to die for! Thanks for the inspiration. I LOVE that color and how you manage to spread a little purple throughout your home. (Like bathroom)! I have no more space for dishes. How am I going to deal with this new obsession ??? Thanks, I think ? Oh Ginger you are too funny!!! I am so glad no one can tell us we must have a certain color or even no color. I guess I will never be in the style of the season. I like your lavender. I am still loving my old world colors. Roses and burgundys. My walls are a very subtle gray so that I can change out the colors with dishes. Currently I am using Aqua and red to brighten things up while I am waiting for the snow to go away. ? I love reading your blog postings and seeing pictures of your designs, Anita. However, in today’s post, I saw your best inspiration yet: your beautiful plate racks!! My mother was a very talented China painter, and last year I inherited many of her beautiful pieces. You have shared the perfect way to display them. 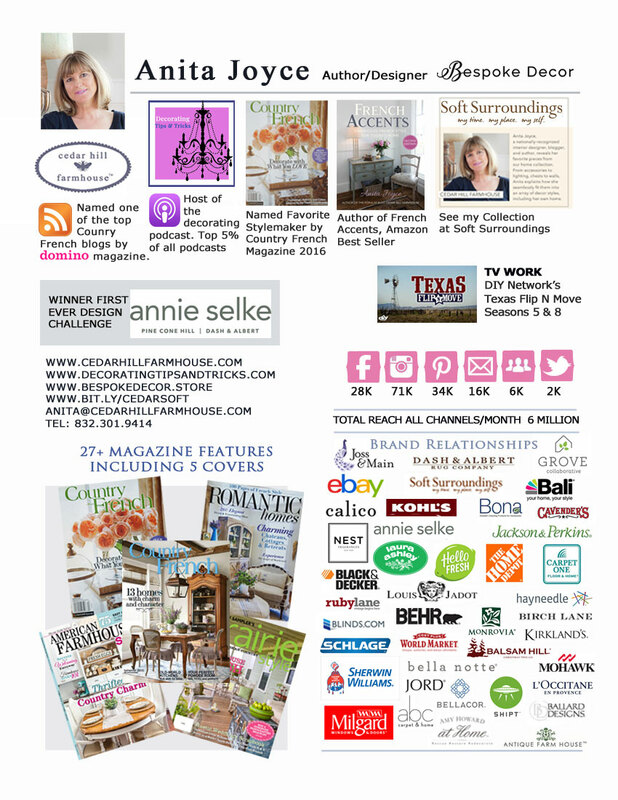 Thank you for the inspiration…I’m going to contact my contractor right now to get started on building some for my breakfast nook! Happy Lavendar New Year! Yes you need plate racks! Just a couple of days ago, I saw the prettiest little throw on Wayfair and loved the colors. I was surprised because it had some lavenders in it and I don’t really decorate with lavender but the color palette really called to me. Do you go “antiquing” alot? Where did you find the dishes? Thrift stores too? Where do you find your antiques? (I find that apsect interesting.) You obviously like “vintage” because that is why I joined your blog. 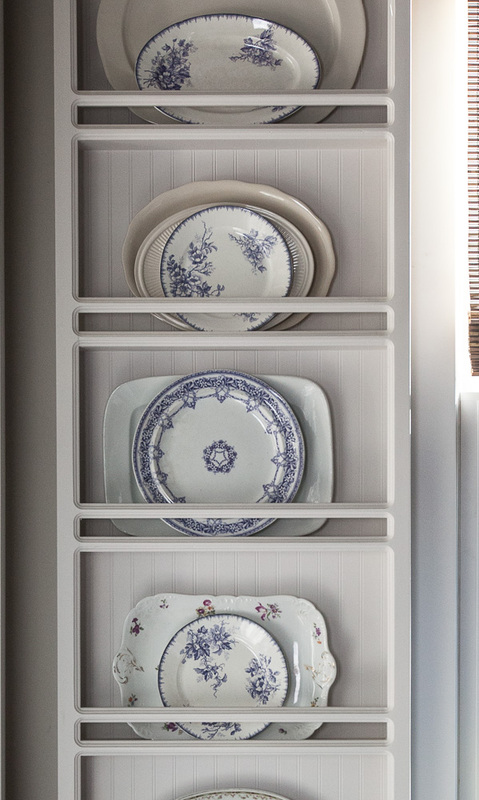 How do you store dishes and decorative accessories you change out? My color for the season right now is deep burgundy. Victorians liked burgundy and it is a cozy color, very rich with velvet throws and needlepont. I like “fussy” and clutter, the “layered” look. I change out for the seasons. It takes some time, but it satisfies me. Gives me reason to own it, display it. Sherry I go to Round Top, thrift stores, antique stores, and I have wholesalers that do picking for me in europe. Purple (especially lighter shades like lavender) is my favorite color and my “farm color”! 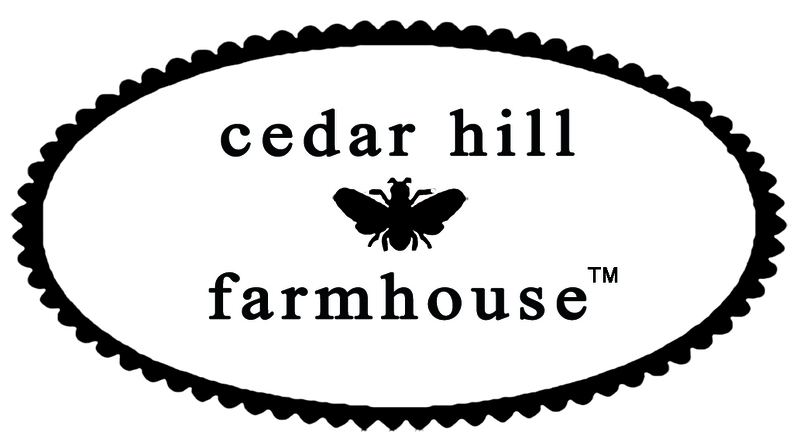 … purple farm sign at the end of my driveway, purple halters and leads for my ponies, and purple flowers/shrubs like catmint and russian sage. This year, I’m thinking of painting my chicken coop purple too! Wonderful choice for your color of the year! HI Anita, I have always loved your plate racks and change is good and pure for the soul even if it’s a slight change, I am more drawn to your periwinkle blue settings, never been a lavender person, nor a yellow person, as well as reds, but this year I am drawn to all of them. My pale small French cottage perhaps could not handle to much of it, but subtle hints are welcome. Always being a big design fan of green I don’t follow Panetone, yet I have found myself drawn to nature in its green and dried sage, and Browns this winter season. I am wanting to add French blue, yes ready for some subtle richness of colour, noticed for its blending beauty more then it’s colour. Also a bit of blacks. Will see, it’s finding area rugs I can’t live without that may guide my colour pallet, living ground up, and grounding my choices in colour. I LOVE French blue Dore. Whatever you do, I know it will be extraordinary! My color of the year this year is green, but not the bright green selected by Panetone. Mine is woodsy, forest green – a color I haven’t used for years. Also, my master bedroom and bath is getting a touch of calm with a pale sagey green in my draperies, pillows and bath towels/rugs. I feel the need for more outside coming in and my choice of greens is moody and calm – kind of like me. I’m so over this cold weather already and looking forward to Spring. I love your color of the year, and I just may be able to add a bit of it in my home! The lavender is pretty and I love the plates, really lovely. I have questions about your ivory stripe rug in Dining room How is it wearing? Is it hard to keep clean, does it get shoe prints? Did you use a rug pad? I like it and have been thinking about which rug to buy for our family room. It will be large…9×12 and I have never made such a large purchase on line, as in it is expensive to send back…thanks! Ours stays clean, but we do not wear shoes in the house. I would not be wearing shoes on one of these cotton rugs. We do not have a rug pad in there. I would not use this rug in an area where it is going to get a lot of ‘shoe traffic’. Jillian, when my Mother was were looking for a rug, our decorator recommended a few online rugs. 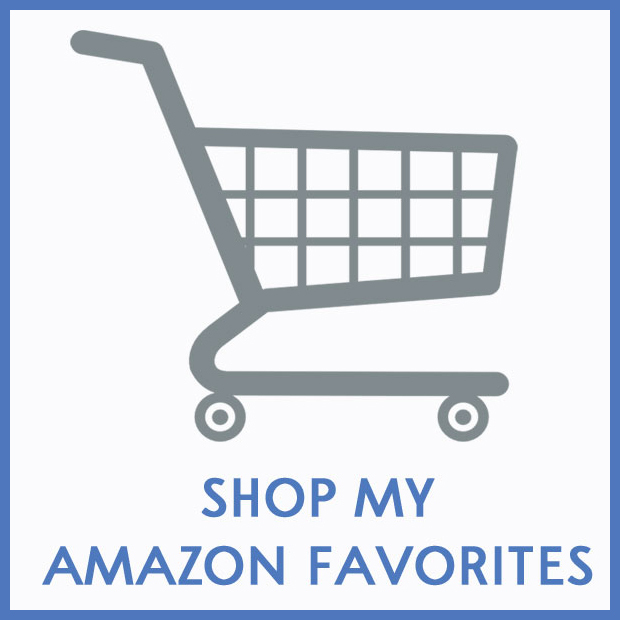 After we narrowed it down to our favorite, I ordered the smallest size and got free shipping. She did not like it , so I was able to send back very inexpensively. Much less stress than shipping a 10 x 13 back! I do not care for the “official” color of the year- it is an acid green to me, yuck. I am also not thrilled with the Benjamin Moore color this year, “Shadow” – a really dark purple bordering on black. It would only be useful in small doses, I think, certainly not as a room color. Your choice is very pretty, I too have dishes on display in my dining room with lavender colored hydrangea patterns. They are from my husband’s family in Germany and date back to the 1880’s. Love the plates will have to search for some on my next trip at the markets in Delft Netherlands . ? Anita, I have become obsessed with your blog! I just discovered it, which is strange, I know. I have to say I like the Pantone “Greenery”, simply because adding greenery to every room is quite calming. However, I almost would have thought of it as a neutral. I adore the thought of lavender and the way you added it is so tasteful–of course!! LOL I would like to begin adding dishes as decor as well. That’s more my goal than having a certain color. So glad to have you here! I love using plates in decor. I have fallen in love with this year’s Pantone color, “greenery”. It is so refreshing! It’s very easy to incorporate through pillows, vases and live plants. It brings a feeling of Spring and Summer to the entire house. Lavender/purple has always been my colors since I was born in Febuary. In my bedroom I have a soft green, some pink and of course, Lavender I am thinking of painting one of my jewelry chests a soft lavender. I love your built in plate racks. I am an avid dish collector and have many plates and platters. The layered look is beautiful. Thanks for the inspiration. I may have to copy this feature in my home! I don’t pay attention to the Pantone color of the year but my color is green so i guess this is my year. 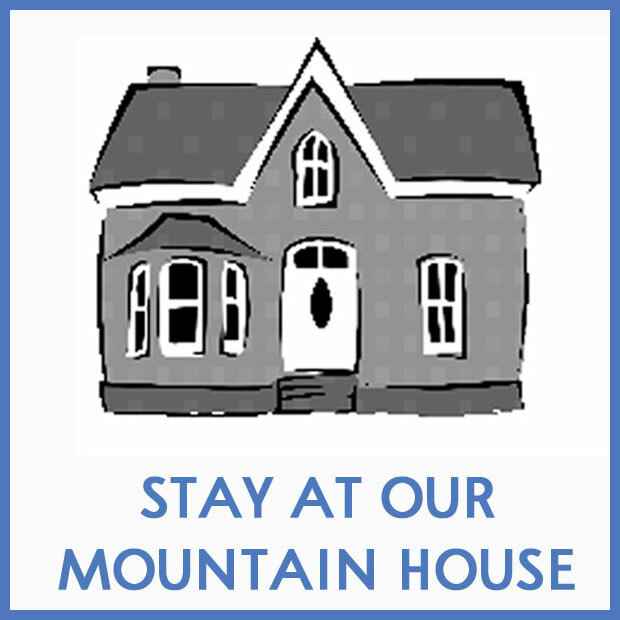 I have a cottage that i am reducing in monotone white/grey and my accent is green. Yeah for me this year. Thank you for showing me how you added purple to you home. Purple is my second color. It’s always nice to know what the color of the year is…however, MY color is what’s important to me…. I think neutral colors with pops of the current ” new” color would by MY choice! Green is nice…could be incorporated with the use of green plants!! However, I do have my mother’s china that has pretty violets on it. I’m always looking for ways to display it. Have not been reading your blog for very long, but I am hooked! You are a true decorating inspiration to me. i like green,but you should choose your own favorite color. The dishes are lovely. You said some are from Holland,did you know in Holland some people do speak French? I love those dishes. Those dishes are beautiful. The color is lovely. Thanks for sharing. I really don’t pay attention to the Pantone Color of the Year in my home unless it’s a color I love. I love your Color of the Year, it’s my favorite color and there’s nothing better than the fresh scent of lavender in your home. I could certainly see myself incorporating Lavender in my home this season over the Pantone color of the year. I have several blue and white pieces, I really like the way you have incorporated the Lavender in with them, it’s beautiful. Keep being amazing!! Anita, your lavender dishes are lovely! I have a cup and saucer with little lavender flowers on it which belonged to my Grannie. I keep it in our china cabinet. My favorite colors are blue and white! Most of our dishes are blue and white. I love all of your pretty dishes, vintage ones are my favorite. I have a few, thanks for the inspiration on how to display them. What a coincidence! I was talking to a friend today and told her: “I want to add lavander and light periwinkle blue to my January decor”. Is so pretty against the rest of my white decor. ♡ . Where did you get your window shades in the dining room? 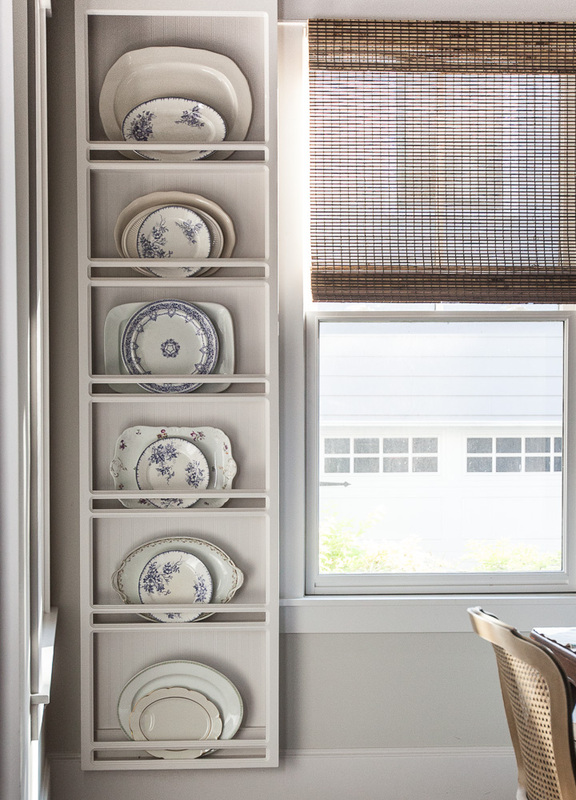 Love the subtle hints of lavender and your plate racks! 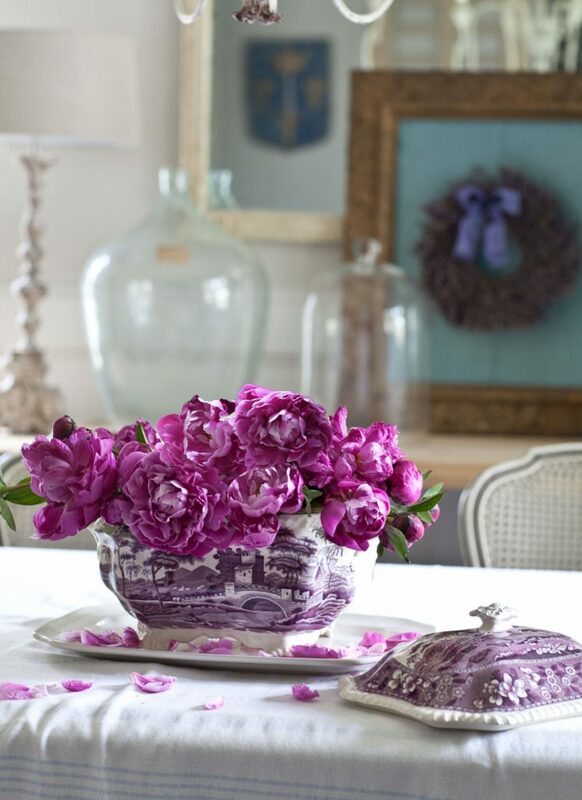 I’ve always been a huge lavender fan, and really love how you have incorporated it into your designs. Your plate collection is really wonderful. Before I sold my home, my master bedroom was a beautiful shade of lavendar, which was so soothing and serene. When the realtors came through, they insisted that the lavender go and I cover it with white. No contest as far as I was concerned! 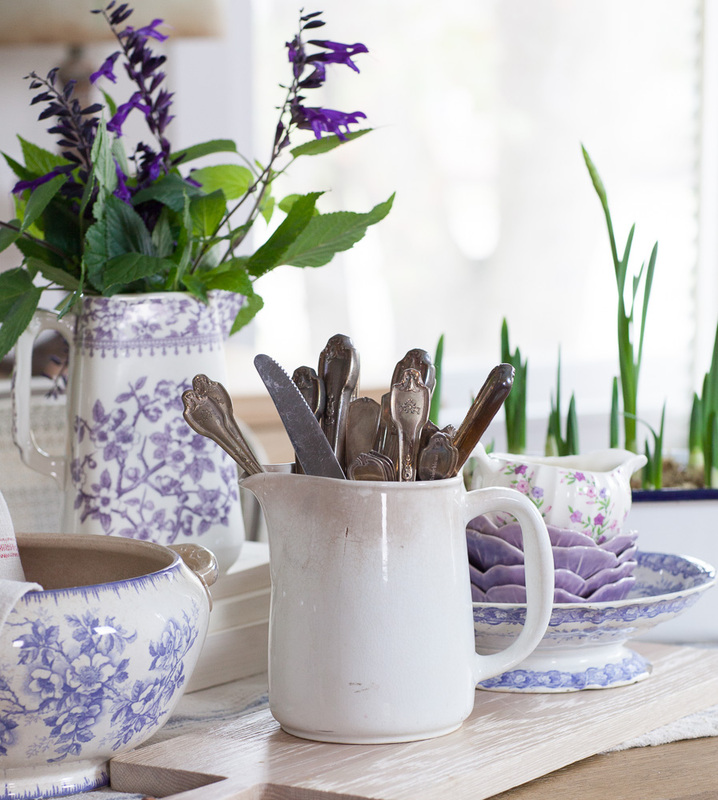 I love how you have layered the blue and white dishes with lavender shades. It highlights both colours and adds dimension. You’ve now got me searching for lavender dishes. I have a few small vases that have violets on them,I will incorporate those too. I am itching for Spring! Keep your ideas coming,I love them all! I never thought of having my own “color of the year” before. I don’t seek out the Pantone color of the year, but I usually run into it in some of the blogs I read or the magazines I subscribe to. I have to say that their color for 2017 is just too “loud” for my taste. I probably would not in a million years use it in my decor. I think my color of the year is turquoise in very muted tones. I’ve been exploring adding it to my decor here and there. Blues are really my favorite colors anyway and that fits in nicely as accents to what I already use in my home. It will be interesting to see over the coming months how popular the Greenery color becomes. Each to his/her own! 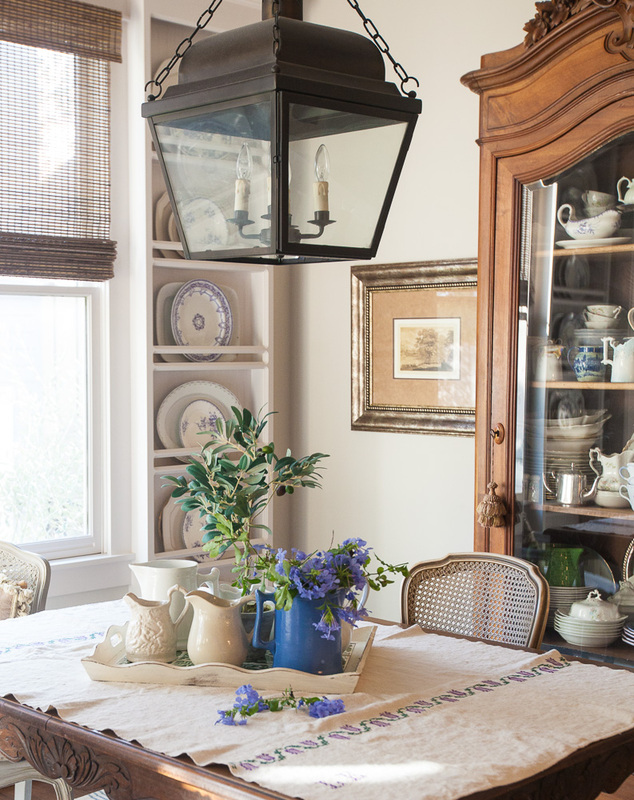 I love, love, love your collection of plates and they look so lovely in the plate rack. I am such a sucker for dishes anyway, but plates are easier to display in the space (or lack of ) in my house. The colors and designs of your dishes with the lilac theme are so pretty. I have a few plates I’m waiting to hang and I’m anxious to get it done. Waiting on the plate hangers I ordered to arrive. Gotta get more inside jobs done before warm weather returns–as if it really plans to! Below freezing temps and killer wind chill up here in Michigan’s frozen territory! Yow! Not my taste at all. LOVE the plate racks – we have a wonderful carpenter – will be having those made very soon……..
Lovely as can be…the lavender is just perfect. I love lavender too and plan on incorporating it once we move soon! 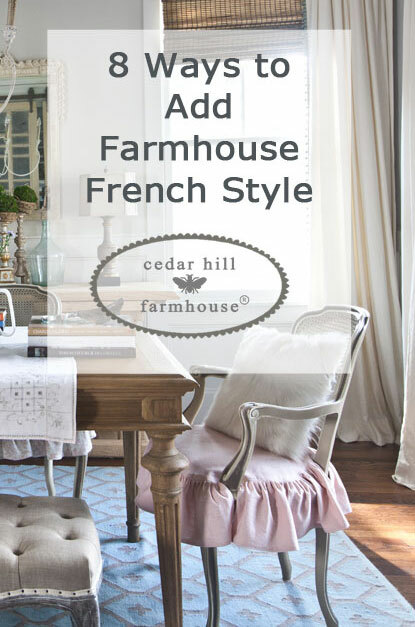 I’ve loved it for years but was especially inspired by that French living room by Pamela Pierce with stone walls, lavender and linen fabric. Do a search on Pinterest, & it will come up! I agree we should decorate with what we love, not based on trends, but I do appreciate helpful design advice on how to use different types of pieces in a space so it doesn’t look haphazard. My favorite plate is the lavender floral in front of another floral in the bottom rack. Purple and green are my favorite colors forever in many hues and intensities. I just always choose them. I too love the plate racks, beautiful. I totally agree that we should all have our own color of the year. Last year, mine turned into pale turquoise/aqua. It’s been fun playing with new shades in my home. I love lavender! At one time, I had a pitcher with the lavender flowers. My personal decorating philosophy is surround yourself with things you love – that make you feel special. Love your photos. I have a question about your built-in plate rack. Is there another one on the other side of the windows, making it symmetrical? I have a weird spot in my breakfast room and I’d love something like that, but I’m concerned about the symmetry. Yes there is one on both sides. I love those dishes in lavender. I have never seen transfer ware in that color. Very pretty. They will be pretty for Spring and Easter decor also. I also love your plate rack. I haven’t really picked a color yet. We just moved into our home this last fall and still haven’t figured out how I want to decorate. But your plate rack did give me an idea for an odd space we have! 🙂 Enjoyed looking at your pictures Happy New Year! Lovely dishes. I have always liked lavender – especially when paired with chocolate brown. Love your lavender. I was thinking rose or blue but now I’m leaning to your delicate, beautiful lavender. Love your plate racks, just wish I had a “spot” for them! I abhor following trends, including the so-called “color of the year”. My favorite is always blue and white. Currently painting my kitchen white and it has blue accessories to add color and texture. I have a growing collection of blue and white porcelain which I adore. Thank you for giving us the nod to choose our own Color of the Yea! So many people don’t think in “color”. By the comments here there are a lot that do – interesting – I am “visual” -to the extreme, so I do. My go to color is the blues you see on European buildings to the indigo of my Mexican dishes or my English Calico dishes. All that said, now that I live in a large cabin in the woods, my kitchen also has red and yellow to brighten things – mainly because as I’ve traveled I find so many wonderful red,yellow,blue things in old country ware. 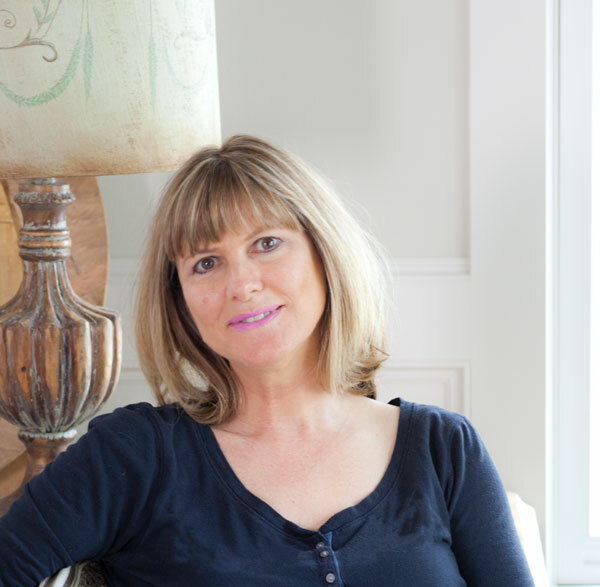 (Having lived in Texas for many years and always homesick for it, I had colorful Mexican tiles scattered throughout my kitchen tile floor – yes, they have held up well). Love your plate holder….happy to see you don’t follow the trends (colors). What woman or home doesn’t look beautiful in purple! Yea!! I never pay attention to what anyone else says about what I should or shouldn’t do in decorating my own home. If you can’t have what you want to see in your own private space, then where in the world can you have it? I enjoy seeing others’ homes and ideas but I prefer living with some neutrals but I also I can’t live without colors. Love sage, lavender, purple, mauve–and dishes, lots of dishes…. 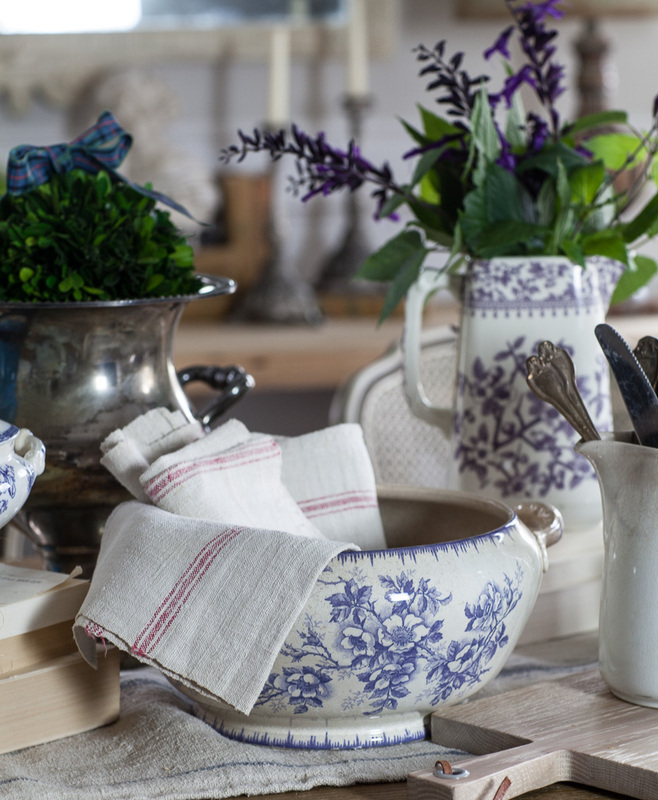 Oh your purples and plums and lavender ironstone transferware pieces are delightful! And that is SUCH a great color for Easter – traditional and lovely color for Easter! Like you, i am a collector of dishes. i collect pink transferware which makes a gorgeous table when done. I collect flowered bone china plates with handles and pink and green depression glass. Some hang on walls, some sit on shelves and most are used in table settings. My motto: everything pretty and nothing matchey. Love the lavender! I plan on adding the color to my search. Yup, they look like hearts to me! Aww so sweet, I love it!!! I chose lavender as well! I was inspired by a beautiful handmade lavedar soap I was given by a friend. I decided to “redo” my bathroom around it. I did use lots of “sage” green accents with it. Lavender has always been my go to, never fail favorite. (Can we say child of the 80s?!). Its soothing color is always calming and beautiful. I LOVE that you chose use imperfect items to decorate as well, choosing to see the beauty, rather than the imperfections…now that is inspiring. Kristi, I love lavender too! I adore your dishes and the soft lavender hue. My favorite Spring flower is the lilac. 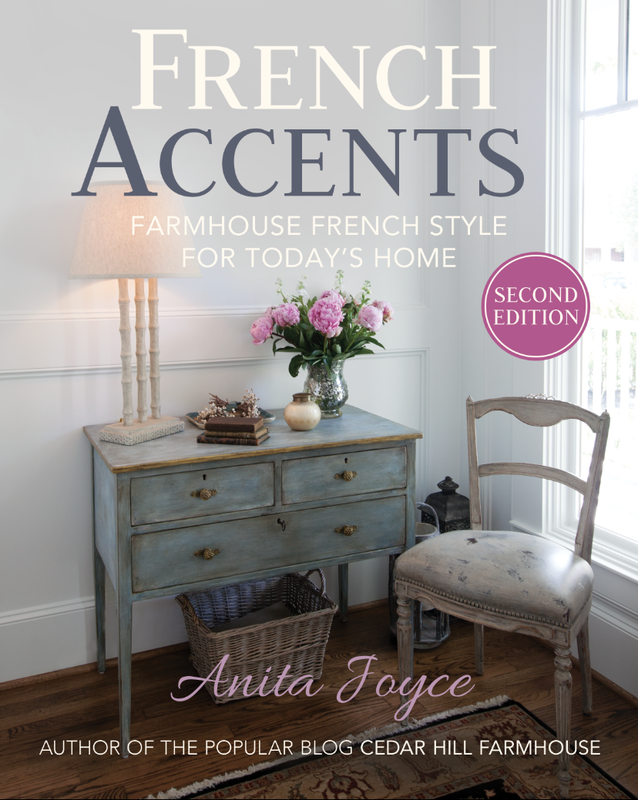 I just received your book, French Accents as a birthday gift from my daughter. I am loving it more with each page turn. I’m so happy to have discovered you and I am also enjoying every podcast. Decorating my home and collecting dishes brings me so much happiness. Thank you for the lovely blog. I like your style and your attitude! I’m going to give some thought to my color of the year for 2018 when it rolls around. Your words are so encouraging–the color hues of lavender don’t have to be the same, the dishes and the provenance isn’t of importance–it’s all about what you like. That inspires me to keep on decorating with what I like, and not get so intimidated by the trends. Thank you! Oh Jolene, you GO GIRL!! I just loved re-reading this post. It is exactly how I feel in color choice and decorating. As an additional comment to your Plate Rack. My favorite display over the years for my Platters. Every home we have owned over the years. My darling husband has become an expert in making every size mentionalble, narrow, wide but always long. Love how you incorporated yours in the dining-room along with the buffet. Lovely article. I pay attention to the color of the year only because I like to watch if it comes true within the decor magazines, blogs, etc that I follow. I am drawn to cobalt blue and yellow for sweet little touches right now. I must admit I love all colors… If I were to choose – Lavender – Blue would be on top. I absolutely love the way you are constantly changing things in your beautiful home. 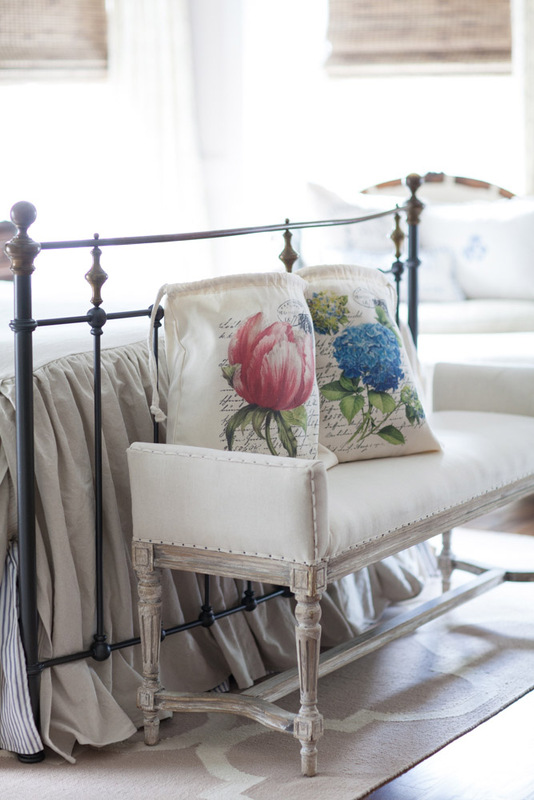 A small change can make the biggest difference in the way your room feels. I love the pops of color that you add as well. Keep up the great work! My color of the year in my MBR/MBA is called “Ivory Lace” by Sherwin Williams. It is a great neutral that I am using with earth tones in the stonework, beams and granite. I am also using shades of blues, lavenders and yellows as accents. I love looking at your blog for inspiration! I love your plate rack, I’ve been trying to figure out where I can put one. I have heard that this years color is purple, I have always loved purple so I will add more. My bedroom is Hunter Green, it doesn’t matter how much snow we get or what the temperature is, it is always warm and cozy. LOVE those 4 little cabbage leaf bowls – how cute are they! Yes i too love the idea of the plate racks. I have a small kitchen and space on each side of the window which would be great for plate racks!